A person who can immediately fulfill his desires is called, satya-saṅkalpa, or he whose desire, intention, or purpose always comes to pass. We could call Krishna’s various incarnations, the Lord’s “emotional moments,” which when experienced by him create a tangible reality. Of course such “moments” don’t really have a beginning, but because they manifest in the material world for a particular purpose, we speak about them in relationship to time. 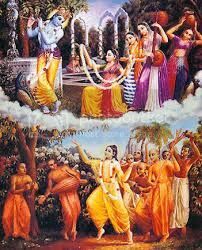 Thus, by Krishna’s arrangement and desire during his lila, or divine pastimes on Earth, upon observing the standard of unconditional love of the gopis, or cowherd women, he began to wonder if he was really the king of love, or Rasaraja. We could call this Krishna’s “existential crisis,” when he began to doubt himself, and felt something lacking. He had never seen such a quality of love, and a desire arose within him to taste this loving sentiment himself. We find in the Chaitanya Charitamrita that Shri Krishna appeared as Lord Chaitanya, for three esoteric, personal reasons unrelated to any purpose in the world, as is the case in his other incarnations. These three reasons grew out of the desire that arose in Krishna when he observed the unparalleled selfless love of the gopis for him, and specifically, as expressed by Shri Radha. 1) “The first purpose [of Krishna’s descent as Shri Chaitanya] was to relish the position of Śrīmatī Rādhārāṇī, who is the prime reciprocator of transcendental love of Śrī Kṛṣṇa. Lord Kṛṣṇa is the reservoir of transcendental loving transactions with Śrīmatī Rādhārāṇī. The subject of those loving transactions is the Lord Himself, and Rādhārāṇī is the object. Thus the subject, the Lord, wanted to relish the loving mellow in the position of the object, Rādhārāṇī. 2) “The second reason for His appearance was to understand the transcendental mellow [experience or taste]of Himself. Lord Kṛṣṇa is all sweetness. Rādhārāṇī’s attraction for Kṛṣṇa is sublime, and to experience that attraction and understand the transcendental sweetness of Himself, He accepted the mentality of Rādhārāṇī. 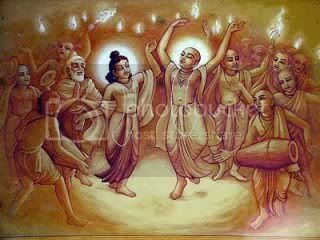 3) “The third reason that Lord Chaitanya appeared was to enjoy the bliss tasted by Rādhārāṇī. The Lord thought that undoubtedly Rādhārāṇī enjoyed His company and He enjoyed the company of Rādhārāṇī, but the exchange of transcendental mellow between the spiritual couple was more pleasing to Śrīmatī Rādhārāṇī than to Śrī Kṛṣṇa. Rādhārāṇī felt more transcendental pleasure in the company of Kṛṣṇa than He could understand without taking Her position, but for Śrī Kṛṣṇa to enjoy in the position of Śrīmatī Rādhārāṇī was impossible because that position was completely foreign to Him. The apparent, or external, reason for the advent of Lord Chaitanya is given as follows: “Lord Śrī Kṛṣṇa, after displaying His pastimes as Lord Kṛṣṇa, [5,000 years ago] thought it wise to make His advent [again] in the form of a devotee to explain personally the transcendental mellows of reciprocal service and love exchanged between Himself and His servants, friends, parents and fiancées. 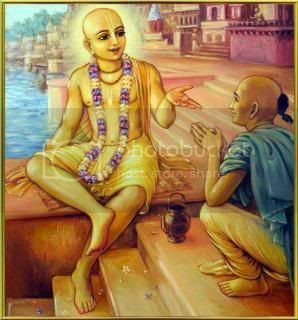 Reading the above should make it clear or remind you that there is much to study and pray to understand with the appearance of Shri Chaitanya. My hope and prayer is that this will fuel your study and help you enter into the mood of the day through chanting the Hare Krishna maha mantra in kirtan and/or on beads in japa, offering other prayers, and reading or hearing about Shri Chaitanya, his associates, and teachings and activities, in good company. Saintly association is a primary way we make spiritual progress, as Saints, or Sadhus, share their faith, feelings, and realizations. In the comments section I provide additional information about Shri Chaitanya’s teachings.